Care for a bit of apocalypse with your tea? The mind of Andy Baumgart must be a very interesting place. Somewhere in that chaotic cranial coolness, there was a collision between the neurons responsible for housing the military schematics repositories, the hot rod files, and 90s girl LEGO themes. Thus, out popped the T-42 “Sugarcube” MLRS, which has got to be one of the most insane (and insanely awesome) military vehicles to ever grace our site. 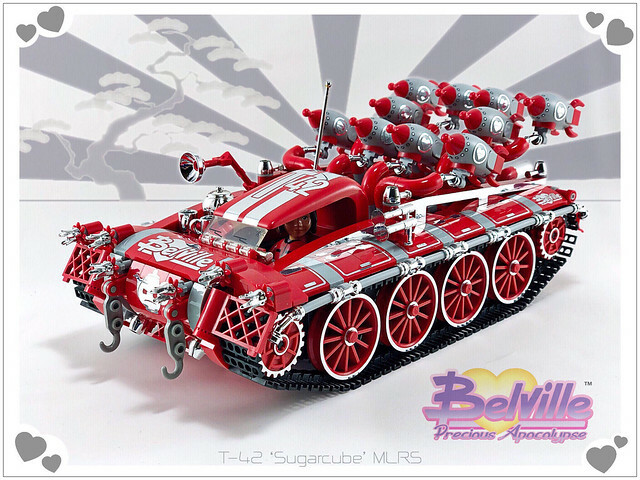 Studded with nearly every chrome silver element LEGO has ever produced, and jazzed up even more with a generous dose of immaculately applied custom decals, this red rocket launcher houses a single Belville figure. As we’d expect with Andy, there’s no shortage of fantastic and unusual parts usages. The most obvious, of course, are rockets sprouting from the back which hail from the Series 17 Rocket Boy. The roof is a piece that isn’t seen often, but is actually being used for its intended purpose, having been a Fabuland vehicle top. Look closely, and along the side you’ll spot a well-disguised derrick arm, while Belville crowns and classic gates line the front. Of course, you wouldn’t want to miss tea time, so there’s a set just in reach of the driver. 1 Comment on Care for a bit of apocalypse with your tea?